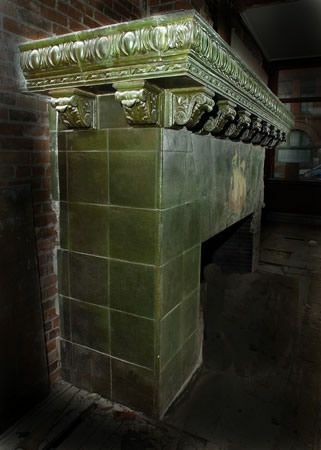 Beverly, MA -- Just weeks after announcing that he had acquired a major installation of Grueby tiles from a Cleveland bathroom for the Two Red Roses Foundation, Rudy Ciccarello was the successful bidder on a rare and important Grueby tile fireplace surround at Kaminski's August auction in Beverly, Massachusetts. 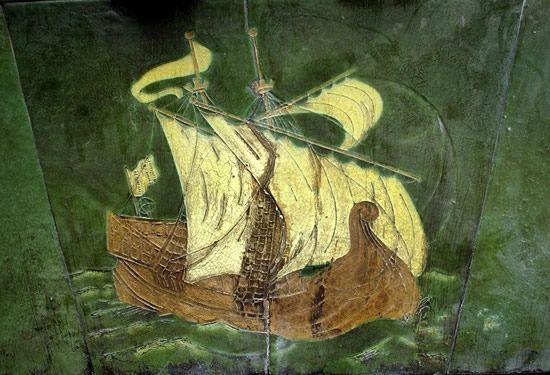 The large-scale fireplace features a two-panel sailing ship at the center of a green-glazed field, with heavy brackets and moldings supporting a mantel shelf almost six feet high. 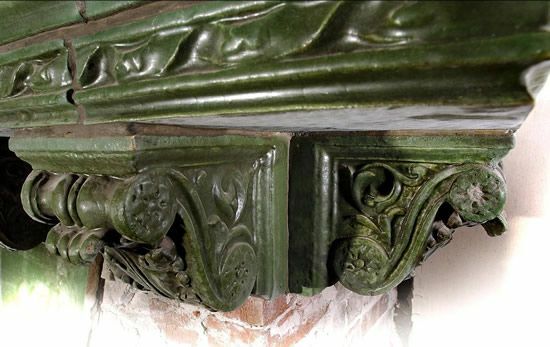 The mantel facing was removed from an Auburn, Maine storefront which had changed hands many times since the late 19th century and was undergoing renovation for a restaurant earlier this spring. 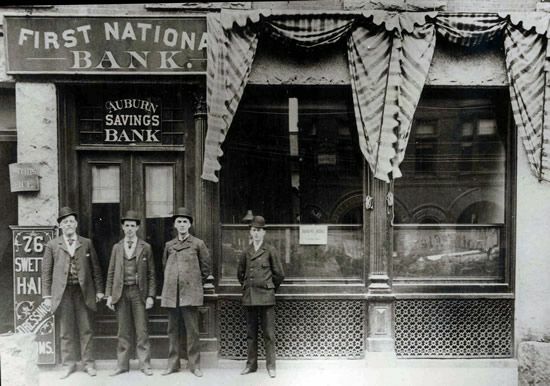 In 1903, the First National Bank remodeled the space as their public banking offices, adding a handsome, heavily barred front door, mahogany-stained counters, wainscoting, and paneling, and leaded glass windows, all meant to convey prosperity and confidence. 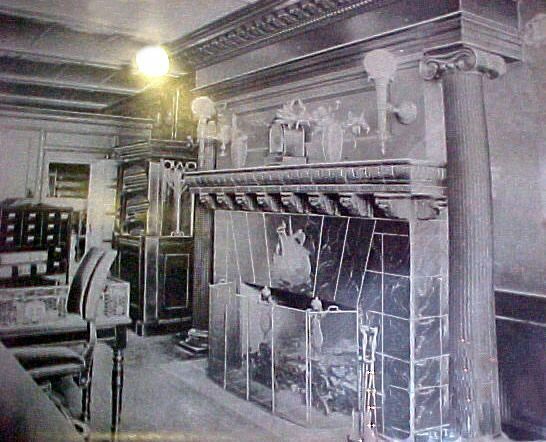 The Grueby ship fireplace was installed in the lobby as a focal point. 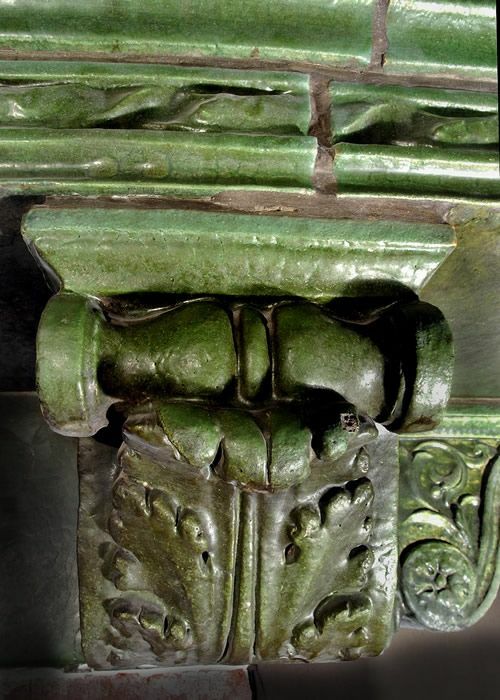 According to a souvenir booklet published at the time, "the fireplace and mantel of mahogany and green tinted Grueby tiles is the most striking single feature of the banking rooms." The ship is a two-masted carrack, a 15th-century Mediterranean cargo ship associated with international exploration and commerce, a romantic icon for a financial institution. With its billowing sails and banners, this powerful vessel charging across the sea also recalls Maine's own glory days as a ship building powerhouse. All of the tiles and faience elements of the fireplace were consigned to Kaminski Auctions for their August 4th sale. They will be restored and eventually reassembled in their original configuration.